According to the Miami Herald, 14-year old Jabez Spann was last seen by his father at a Labor Day barbecue on September 4 in Sarasota Florida and hasn’t been seen since. Spann was at this location a week earlier when he witnessed the murder of 31-year old Travis Combs. He was shot dead. Police are unsure if there is a link between the murder and Spann’s disappearance. Reginald Parker, another witness of the murder, said he heard Spann say “Oh my God. Y’all shot him” before he fled the scene. There is a $25,000 reward for information related to the case. 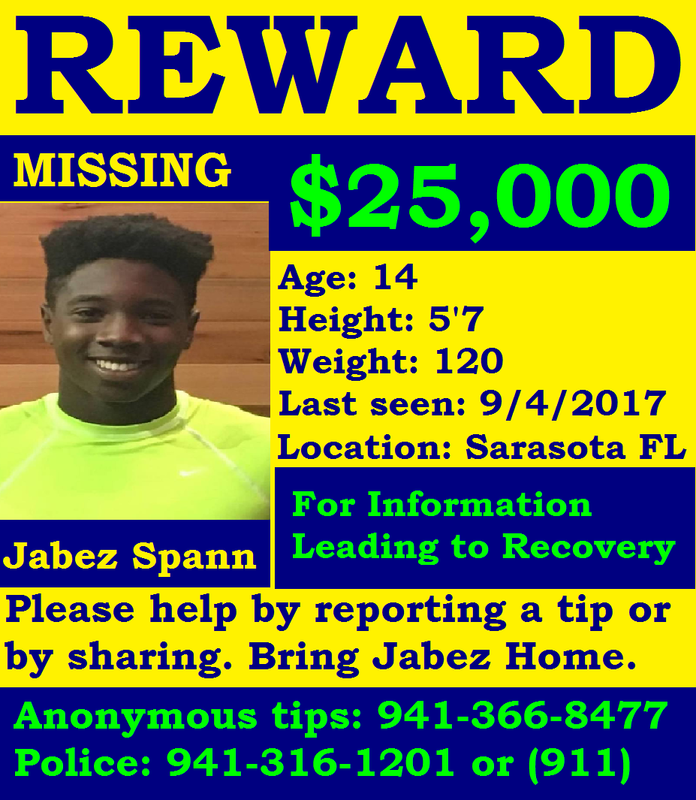 Anyone with information about Jabez’s whereabouts may contact the Sarasota Police Department at 941-316-1201 or Sarasota Crime Stoppers by calling 941-361-8477, or by going online at http://www.sarasotacrimestoppers.com.